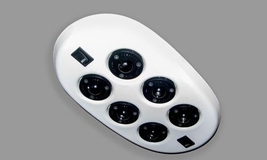 MOD-1 COCKPIT LIGHTS are in thousands of aircraft and were used by Voyager on it's record setting non-stop flight around the world. 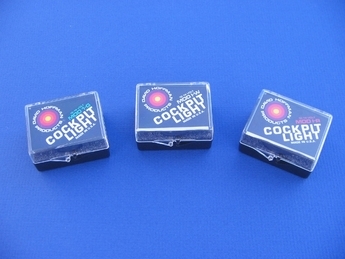 Mod-1's now comes in three colors, 'W', 'R', 'G' (see the 'Mod-1 Cockpit Lights' page for details). 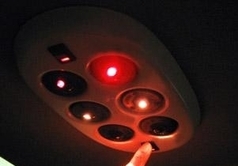 The Overhead Console is available for mounting up to 6 Cockpit Lights per console. Click on the links above for more information on each product. All products are manufactured and made in the U.S.A. 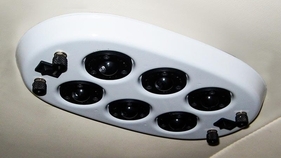 The MOD-1 Overhead Console is mounted to top of cabin or top wing skin with four stainless steel screws into the four standoffs of posts on Console. Lights and switches are sold separately.